Premier Modular, the UK's premier supplier of modular building solutions offers its clients an exceptional service, innovative products and build quality. It is also these high standards that would also determine the quality of their recent refurbishment of the practice itself. 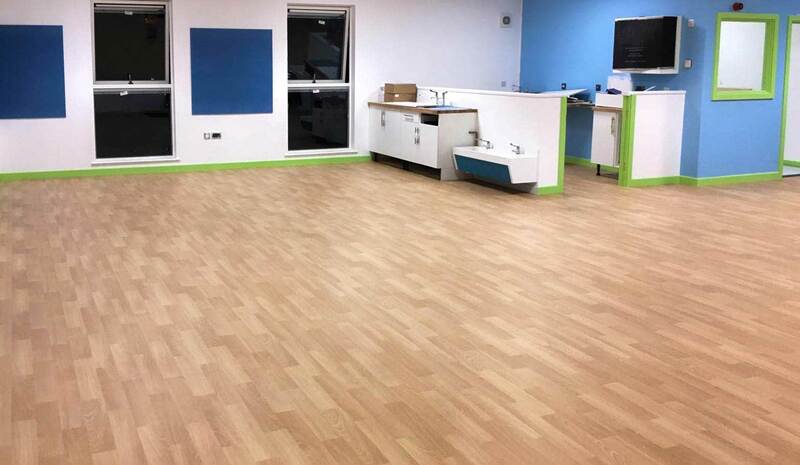 In determining the overall look of the practice and its refurbishment Premier Modular turned to S&D Flooring to who understands the importance of a motivating and workable future proof design. 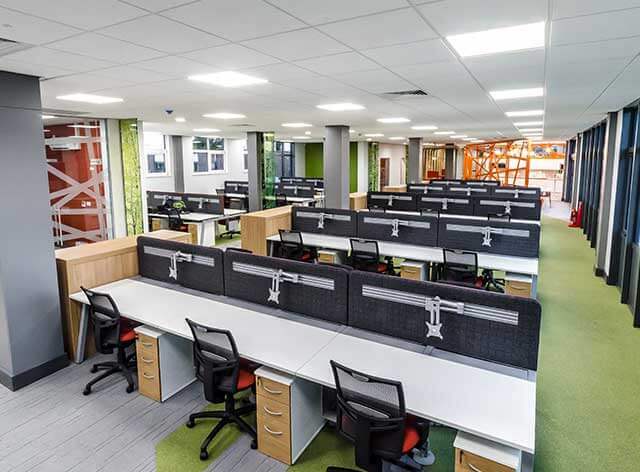 Between Premier Modular, S&D Flooring and Red Frog, a contemporary green and grey colour scheme was agreed to be featured throughout all office work areas. A combination of Desso Rock and Salt ranges was installed due to its striking textured loop pile design and its durability. Available in over twelve contemporary hues, the two complementing ranges create unique spaces and zoning opportunities along with bright bursts of colour. 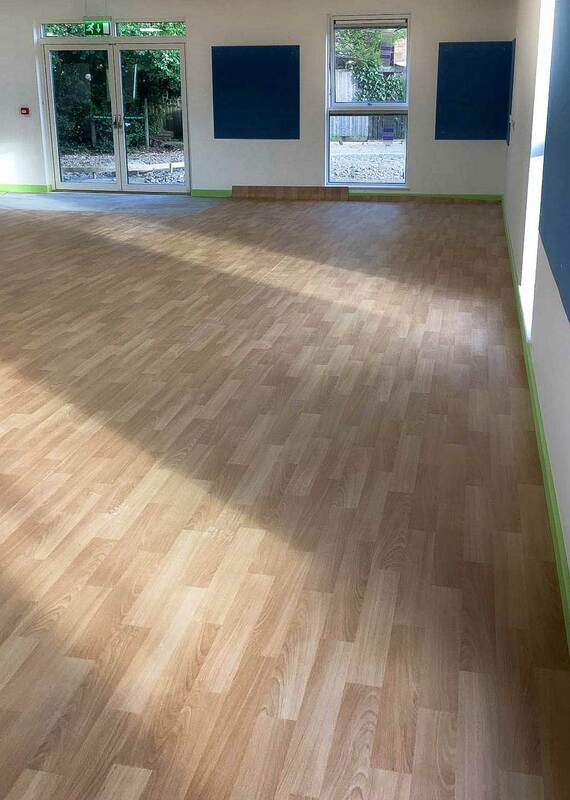 Due to the active nature of Premier Modular, installation by S&D Flooring and the Boys in Blue was carried out across 3 consecutive weekends to minimise disruption to the organisation. Plus one full intensive week installation over the Christmas period. Steve Dixon, Managing Director of S&D Flooring adds our installers worked diligently and with distinction. S&D Flooring was able to complete the project to a high quality that fitted the brief and with little disruption to Premier Modular. After a successful installation of Wards 18 and 19 (See project here) at Castle Hill Hospital, in Cottingham, S&D Flooring were once again appointed by Ark Interiors (part of the Strata Group) to install a wide range of flooring products to assist with the restoration and transformation of a redundant medical ward into a bespoke contemporary office and training centre that is a more useable space for teams. 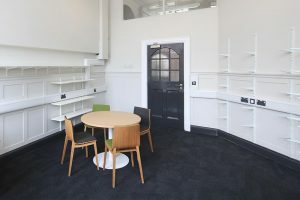 As part of the brief, S&D Flooring was appointed to install a prepared design (from Ark Interiors) that echoes a modern and motivating working environment. This is reflected with bursts of brightly coloured hexagonal carpet tiles that appear throughout the Wards’ breakout area – which to some could be seen as making reference to the atomic structures of proteins and other compounds. Supporting this, features a sea of neutral greys and patches of Karndean Lime wash oak planks. Whereas towards the centre of the ward and down several small corridors features a combination of artificial grass and Desso Essence stripe Green carpet tiles. 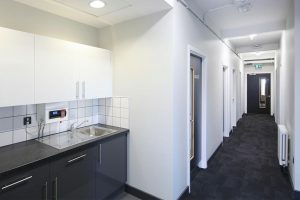 Following from the main hub of the ward consists of several small to medium training rooms and offices that feature a mixture of subtle toned carpets and carpet tiles with strips of bold colours that connect with the colour on their feature walls. Finally, the project also consisted of installing, capping and coving Polyflor PUR safety flooring in two medium sized toilets that are situated towards the edge of the site. With only 48 man-working days available to install over 800 square metres of carpet tiles, safety flooring and artificial grass, plus layers of Damp Proof Membrane and Instarmac Screed. This was surely a fast paced and complex operation – if you’d pardon the pun. One of the challenges S&D Flooring and the Boys in Blue faced during this project was working around several different trades whom were conducting their own wall, ceiling and electrics installations. To mitigate the potential risks of not being able to complete the project on time it was agreed that after completing a sub floor preparation our installers would quickly install flooring in one area whilst trades worked in another before protecting the newly installed floor and moving around to another area of the site. This proved to be successful but challenging at times, especially in the small areas of the site. S&D Flooring installing layers of DPM and Screeds across the entire site. S&D Flooring Boys in Blue working collaboratively with trades. Besides handing over a project to our client, one of our favourite parts of the project was to install the hexagonal carpet tiles as it is shape that our Boys in Blue rarely get to install but look absolutely amazing when installed. Plus seeing the completed project in all its glory, as shown in the images below, makes us feel proud of delivering another top quality installation. Castle Hill Ward 22 Break out zone with Artificial Grass. 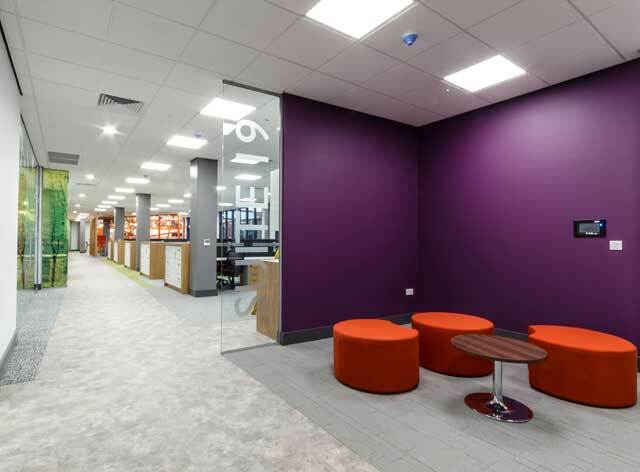 Gary Finch, Business Manager of Ark Interiors said: “After our successful partnerships on previous HEY NHS projects, we again requested S&D to deliver another first-class flooring installation for the new Education and Development suite at Castle Hill Hospital, Hull – our latest design and build scheme. S&D were right in point with our requirements and our schedule of works was adhered to in the usual professional manner by the S&D team”. S&D Flooring would like to thank Ark Interiors for giving S&D Flooring the opportunity to work on another interesting and creative project. Plus allowing us to use and share their project photos on our social media platforms, more of which can be found at http://bit.ly/2x4zDBS. Interface – Broad Ave (em553) Supplied by ARK Interiors. Gradus ETR302F0 Aluminium Mult-Purpose Trim. Instarmac DPM IT Prime It Level 2. An eventful and interesting installation at Castle Hill Hospital in Hull. Over a three-week period, S&D Flooring was tasked to supply and install over 1,500 square metres of a variety of luxury carpet tiles and luxury vinyl tiles and sheet vinyl across Wards 18 and 19 on behalf of Ark Interiors – part of the Strata Group. Ark Interiors and S&D Flooring have a long standing and successful working relationship. It was an easy decision to engage the S&D team when we needed a forward thinking, flooring contractor who could bring our designs to life for the NHS Castle Hill project. Well done to all at S&D for completing our challenging flooring concept on schedule. – Gary Finch, Business Manager for Ark Interiors. Part of the project brief was to install a design that would help create a clean, open, and fresh atmosphere that reflects a modern and motivating working environment. This is reflected with a neutral colour palette with hints of warms bright colours. 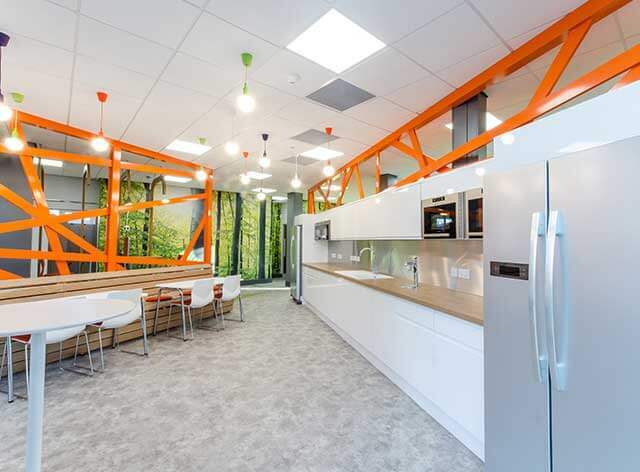 One of the many bold features that S&D Flooring installed was a series of warm green carpet Desso Fusion Rock tiles that run through the informal and formal working areas. Adding to this, a contrasting neutral grey Expona Design Roman Limestone Vinyl creates an obvious and visually pleasing walkway that threads through the ward; informally separating other zones. All we had to do was follow the pattern! With its many straight lines, block zones and limited curved shapes, installing the products was a relatively straight-forward task, after all, all the S&D Flooring Boys in Blue had to do was follow the pattern. However, during the subfloor preparation, a few issues arose that required some creative thinking for our team of highly skilled floor layers. When we first attended the site it was apparent that the ward was split up into several areas with different flooring, materials, sub-floor heights and levels. So the first task was to remove all previous flooring materials, screeds and renovation materials to reveal the base. We then used an external contractor to bring the sub-floor to its original state. Once this was done a moisture test revealed a high reading which meant a DPM was needed to be installed. We also needed to level the subfloor to receive our floor finishes. To achieve this we installed a sandwich of Ardex NA, Ardex DPM1C and another coat of Ardex NA. Not only did this bring the subfloor to a clean smooth working surface but also eliminated the potential for future problems such as rising moisture. At S&D Flooring we can provide home owners in Yorkshire and Lincolnshire a truly unique flooring service. You will find we have the perfect flooring solution to suit any type of room, be it bedroom, wet room all the way through to your garage. 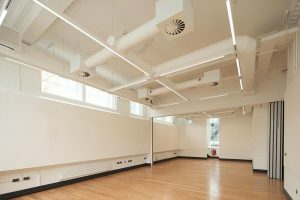 This project consisted of a three month installation across five storeys at the University of Leeds, School of Fine Arts on behalf of Sewell Construction. S&D Flooring were very fortunate to be a part of a fantastic project that allowed the S&D Flooring Boys in Blue to install a wide range of contemporary flooring products to create many stylish and functional areas. 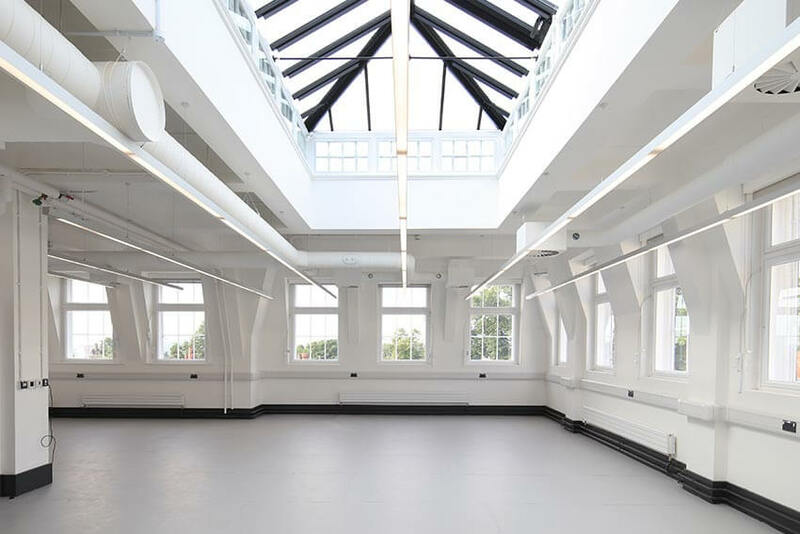 Ever wondered what a renovated Art School looks like? 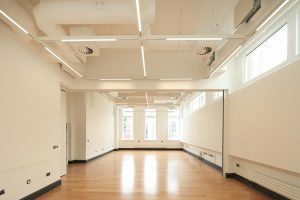 With over 1,200 square meters of Luxury Vinyl Tiles, Carpets, Barrier Mattings, Adhesives and Primer S&D Flooring has helped breathe new life into this historic building situated in the heart of Leeds. 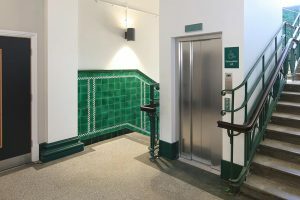 It’s many corridors and art studios now feature a bright and open space fitted with a simple, yet, contemporary 2 mm thickness Forbo Eternal (Mercury) and Surestep Star (Mercury). The contemporary tones offer hints of grey and a unique aesthetic. The Forbo Eternal ranges is a high quality heterogeneous sheet vinyl floor covering that fits all general purpose needs in various segments and applications. 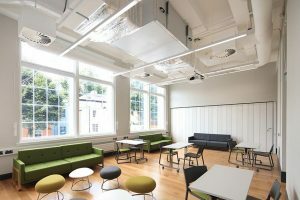 Whereas the School’s more quieter small group study and lecture areas now feature a range of stylish carpet tiles from the Milliken Nordic Stories Range. The Nordic Stories range brings Scandinavian-influenced color and texture to the floor plane, paying homage to a series of diverse countries that have collectively helped define contemporary design culture. 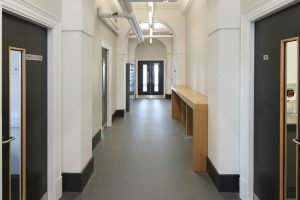 Across the School of Fine Arts five floors S&D Flooring have installed Milliken Hidden Plains Ash Blanket HDP119-27 and Tectonic Dark Dansk TTC79-133 Carpet Tiles. Rollits LLP, a leading legal firm that was founded in Hull, undertook a major rebranding to help align itself with the requirements of a 21st century law firm and meet the needs of its staff and clients. Ark interiors, who won the contract, appointed S&D Flooring to install 3 floors of contemporary Karndean Palio Clic flooring alongside the carpet tiles. S&D Flooring would like to thank Ark interiors, The Strata Group and Ally Byrom Photography. An awesome installation at Oldbrook Primary School, Hull.